Claude Monet, Rue Montorgueil, Celebration of 30 June (1878), oil on canvas, 81 x 51 cm, Musée d'Orsay, Paris. Wikimedia Commons. Available for Kindle (£21.89/$33.15) and in the iTunes Store (£21.99). This is the book which has inspired this whole series, and which is likely to change much of our thinking about painting, perhaps art in general. It may well be the most important book about art of this decade. This extended essay, itself an experiment in presenting such ideas, considers eleven paintings from Courbet to Picasso, and argues that this assumption is not valid. A fundamental concept is that of emergent systems. In such systems, interactions of simple behaviours at one level of a complex system cannot determine behaviours and events at a higher level of the system. For example, it does not matter how thoroughly you understand the anatomy, physiology, and behaviour of a single ant, you will be unable to predict how a whole farm of ants will behave in response to a threat, the arrival of a food source, etc. The phenomenon of emergence is one which is often lacking from ‘popular’ science, which assumes, for instance, that complete understanding of the human genome will result in complete understanding of humans and their ailments, or that knowing complete details of the wiring of the human brain will allow you to understand how and what humans think. It is Herbert’s contention that the tens of thousands to millions of brushstrokes which make up paintings are such an emergent phenomenon, much of which is created by habitual or sub-conscious actions on the part of the painter. He starts the detailed presentation of his case with Courbet, “perhaps the first [French artist] to make a concerted effort to achieve success outside the institutional confines of the Salon” while painting with loose technique. His first example from Courbet, The Waterspout, Étretat (1870) is ideal for the examination of Courbet’s artistic process which follows. Herbert then moves on to Courbet’s The Roe Deer’s Shelter in Winter (c 1866) and its dual nature. Herbert explains how these paintings led to the myth that the brushstroke expressed the authentic and autonomous self, which is a manifestly inadequate account of Courbet’s (or anyone else’s) painting. Here, as elsewhere, Herbert is heavily reliant on a key chapter by John Haugeland (1945-2010), which is available here. 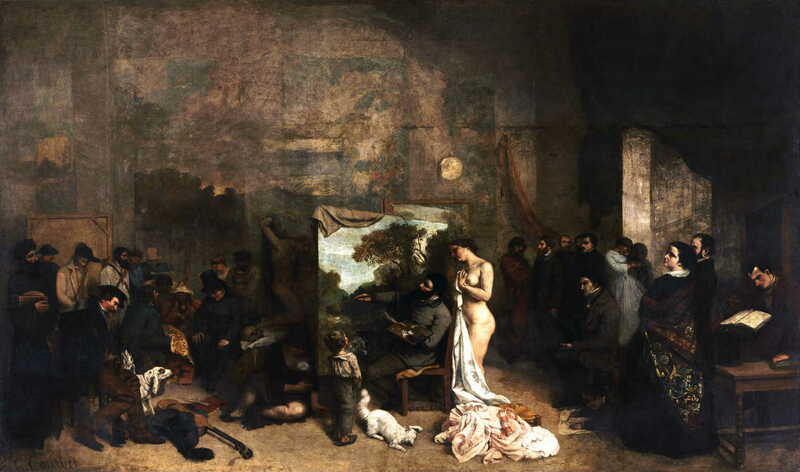 Gustave Courbet, The Painter’s Studio: a Real Allegory of a Seven Year Phase in my Artistic (and Moral) Life (1855), oil on canvas, 361 x 598 cm, Musée d’Orsay, Paris. Wikimedia Commons. Discussion then moves to a painting which I would not have associated with the topic of brushstrokes, Courbet’s The Painter’s Studio (1855). One of the great ‘problem paintings’ which has been extensively analysed and ‘explained’ as allegory, Herbert challenges the conceptual coalescence of the painting and those proposed analyses, and argues that trying to determine whether it is allegorical or realist is asking the wrong question. Édouard Manet (1832–1883), Music in the Tuileries (1862), oil on canvas, 76.2 × 118.1 cm, The National Gallery, London, and the Hugh Lane, Dublin. Courtesy of National Gallery (CC), via Wikimedia Commons. 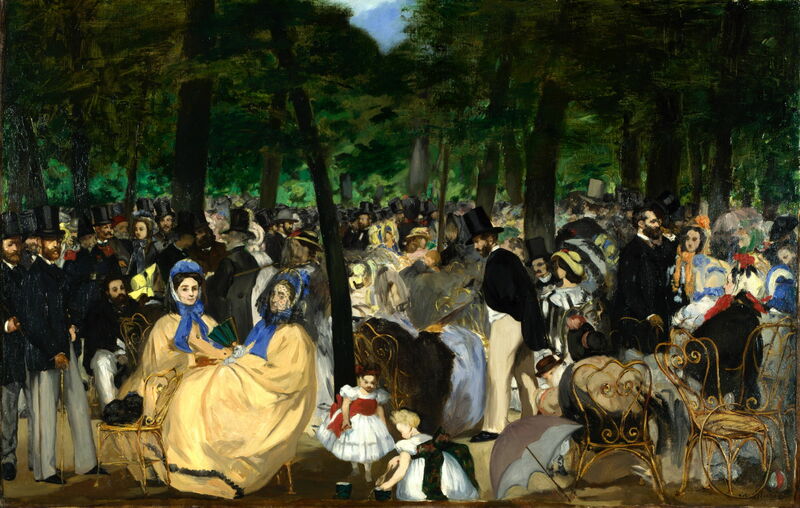 Herbert then moves to Manet’s Music in the Tuileries Gardens (1862), followed by his A Bar at the Folies-Bergères (1881-2). Just as Courbet did not exert constant executive control over his brushstrokes, Herbert finds that Manet did not, either. 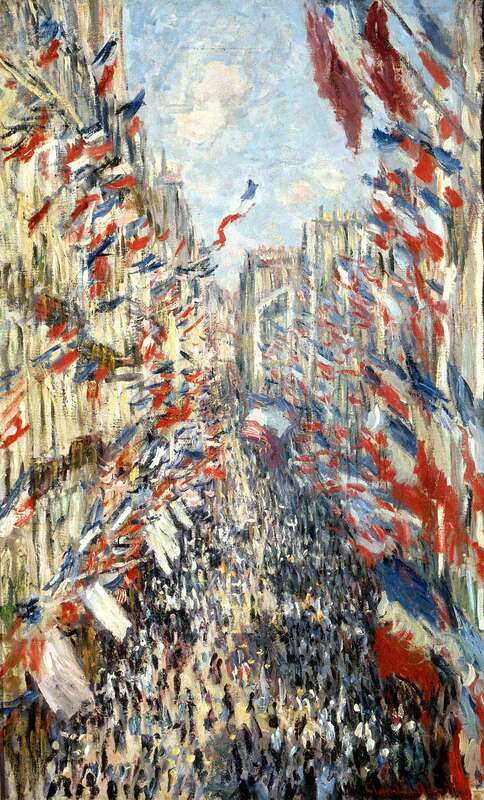 Claude Monet, Rue Montorgueil, Celebration of 30 June (1878), oil on canvas, 81 x 51 cm, Musée d’Orsay, Paris. Wikimedia Commons. Monet’s Rue Montorgueil, Celebration of 30 June (1878) is next for analysis, and a marked contrast: outwardly a far ‘simpler’ painting with a profusion of very obvious brushstrokes, it proves fertile ground for Herbert’s argument. For this, he invokes fractals, which appear remarkably appropriate in this context. He also points out that Monet could only have painted the view by imagining it, creating a disembodied view which, by distorting reality, better reveals it. 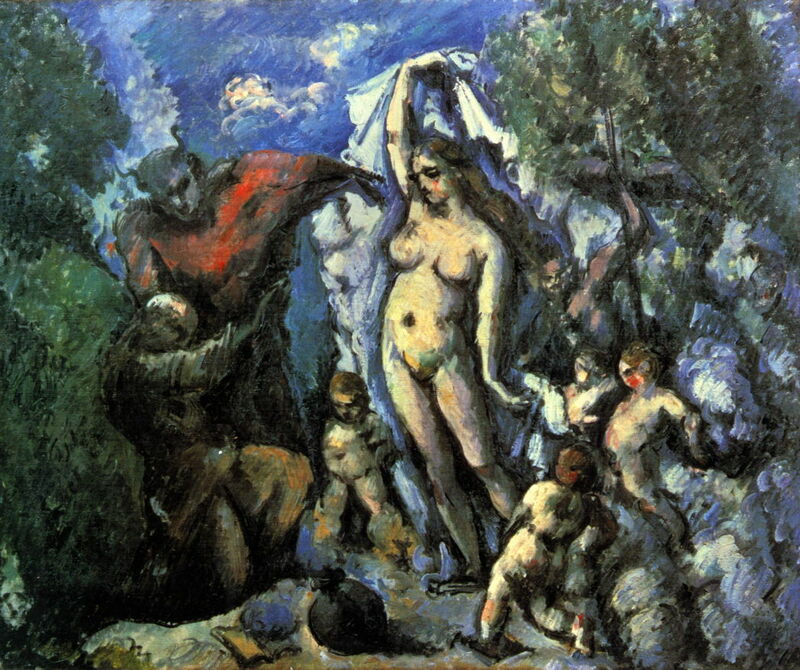 Paul Cézanne, The Temptation of Saint Anthony (c 1875), oil on canvas, 47 x 56 cm, Musée d’Orsay, Paris. Wikimedia Commons. From Monet, Herbert takes on a greater challenge with Cézanne’s The Temptation of Saint Anthony (c 1875), further complicated by a brief glimpse of James Ensor’s Tribulations of Saint Anthony (1887). He concludes that Cézanne lacked executive control over the excess of brushstrokes he laid down on the canvas, and that those marks are rampantly emergent in nature. 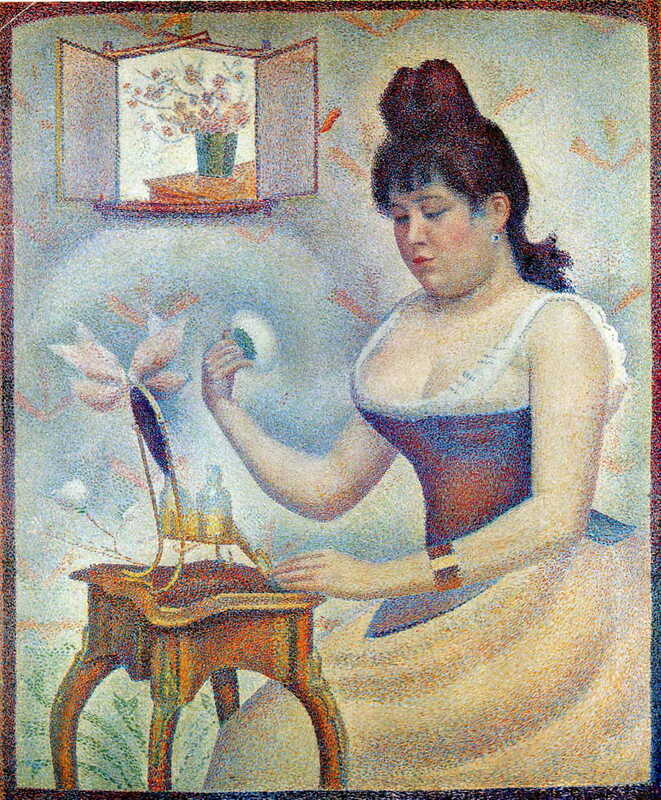 Georges Seurat, Young Woman Powdering Herself (1889-90), oil on canvas, 95.5 x 79.5 cm, Courtauld Institute Galleries, London. WikiArt. I was surprised to see the next paintings in an essay about brushstrokes: Seurat’s Sunday on the Grande Jatte (1884) and Young Woman Powdering Herself (1889-90). The former, perhaps because of its early acquisition by the Art Institute of Chicago, has become something of the canonical Divisionist painting, almost to the point of exhaustion. However, Herbert shows us that Sunday on the Grande Jatte itself provides very limited visual support for the received account of the new ‘scientific’ means of painting. As he writes: “It is surely time, after all these decades, to admit that the emperor has no clothes” and that there is almost no optical mixing or simultaneous contrast. In reality, he contends, the multiplicity of different marks and colours more often behave like dust motes caught in the air: they are an emergent phenomenon. For me, this is the point at which Herbert has driven the final crucial nail home, and left no room for any doubt. Finally, he takes on Picasso’s Cubist Ma Jolie (1911-12) in a series of detailed views which reveal Picasso’s facture. I confess that my personal difficulties in getting my head around that painting made it hard for me to engage in his argument, but I am sure that other readers will follow his points about Picasso’s control and its limits, which lead in to Clement Greenberg’s reading of the Cubist counter-revolution. Herbert finishes with a brief return to Cézanne, and closes. End-matter consists of extensive supporting notes with references, and an index of the eleven principal discussions of featured paintings. It is a shame that the publisher appears to have considered the book too short to merit a thematic index, which would have been valuable. At least there are searchable electronic versions available for purchase, but as I have remarked before, this makes it much harder to use a printed copy of the book. This is an exceptional book, and one of enduring importance in our understanding of the making of paintings, of painting itself, and of art generally. It is not always easy reading, although Herbert is careful not to overburden us with the theory of emergent phenomena, and his writing is always clear and accessible. Read its wisdom and insight, and from it I have no doubt that this field will develop further. Posted in General, Painting, Technology and tagged brushstrokes, Cézanne, complexity, Courbet, emergence, Ensor, gesture, Impressionism, Manet, mark-making, Monet, painting, Picasso, Seurat. Bookmark the permalink. Who will bear the brunt of backdoors in encryption?